Government Wrongs. Don't Change Our Rights. 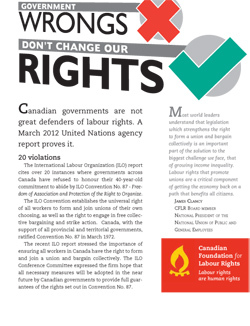 This pamphlet provides a summary of a March 2012 International Labour Organization report reviewing the extent of Canada’s compliance to the ILO’s most fundamental Convention – No. 87, Freedom of Association and Protection of the Right to Organize. The report cites over 20 instances where governments across Canada have refused to change labour laws the ILO has ruled in the past to be not in compliance with Convention No. 87.